Carara National Park isn’t just any old protected area. 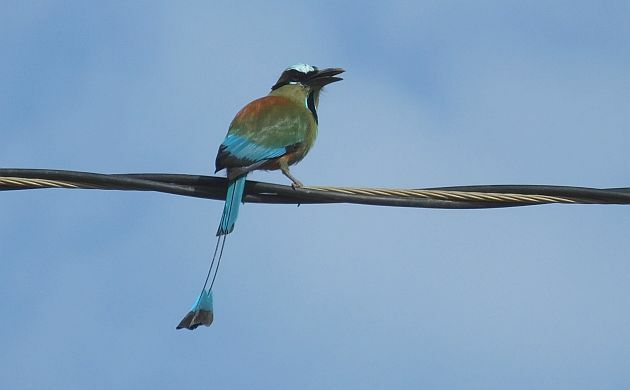 It’s one of the top birding hotspots in Costa Rica and Central America. Actually, it’s not really the park on its own that is responsible for such accolades but the protected area in conjunction with the surrounding mega blend of habitats that include rainforest, tropical dry forest, mangroves, an estuary, and the usual addition of open fields and second growth that always boost the bird list. Visit the area and you might not know where to start. That’s alright because given the wealth of bird species all over, you can begin with the binos wherever you want and always see a lot. 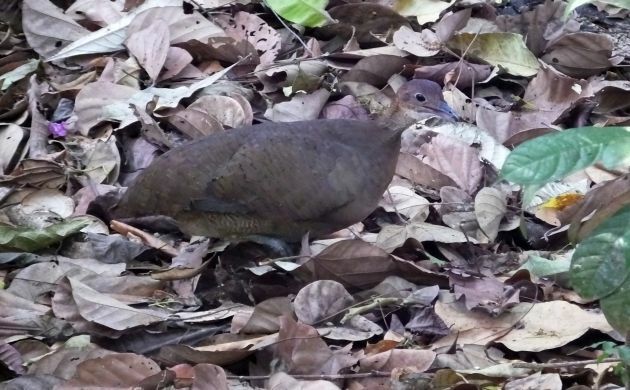 Great Tinamou: Carara is one of the easiest places for close looks at this widespread species. 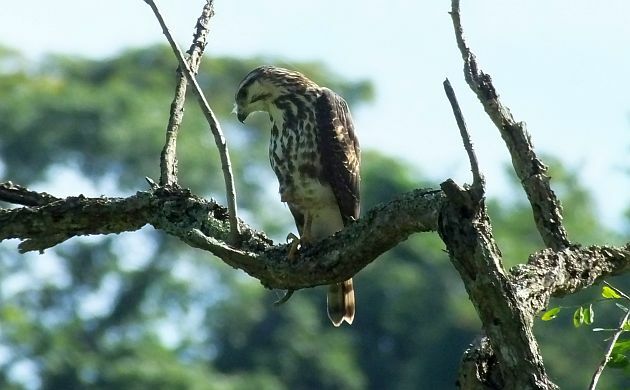 Raptors: Hawks and their like are not all that common in Costa Rica. The Carara area is nice because it’s pretty good for racking up a sweet raptor list of ten or more species. This one is one of the more common species, a juvenile Gray Hawk. 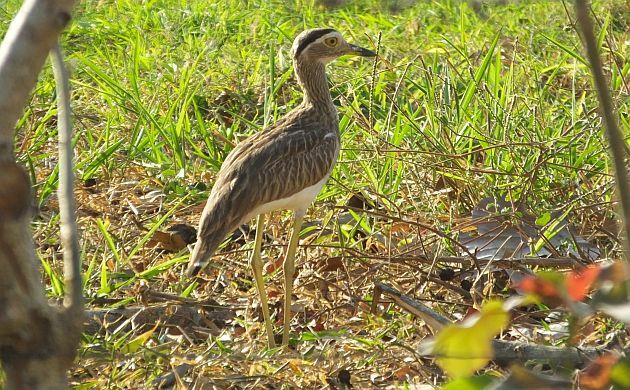 Double-striped Thick-Knee: This weird species is regular during boat tours on the river, and can also show on the Cerro Lodge road and some other nearby sites. Does it really have two stripes and thick knees? Thankfully, this is one bird that will stand around long enough to let you decide for yourself. Charming Hummingbird: I guess “charming” in this case means “looks alright but not exactly spectacular”. However, since this is a regional endemic, it makes it onto the list. 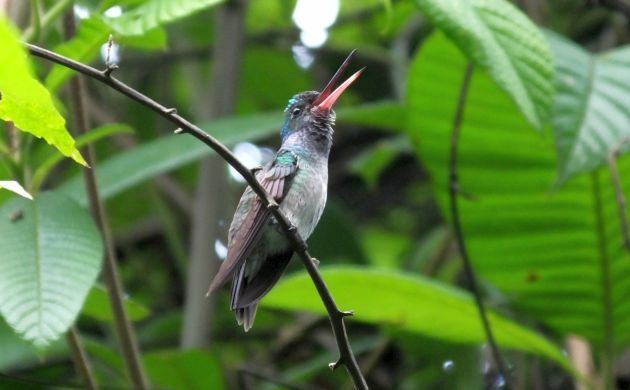 If stuff if flowering, a dozen or more hummingbird species in and around Carara is par for the birding course. 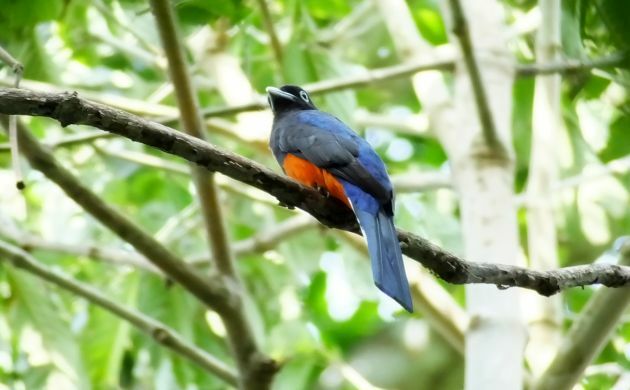 Baird’s Trogon: Unlike a sparrow of the same name, Baird scored big on beautiful colors with this bird. Another regional endemic, it’s actually more common further south. This is also one of five trogon species regular in the area. 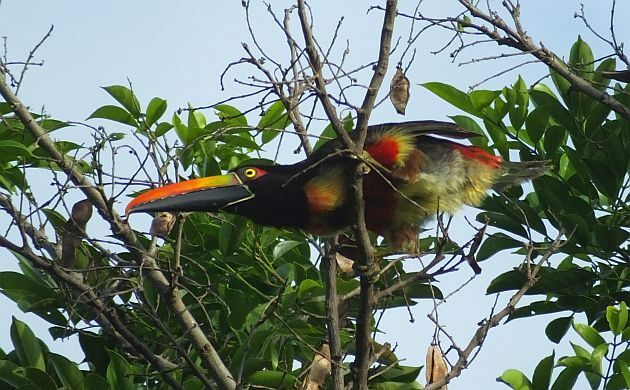 Fiery-billed Aracari: Nothing like a toucan of many colors! 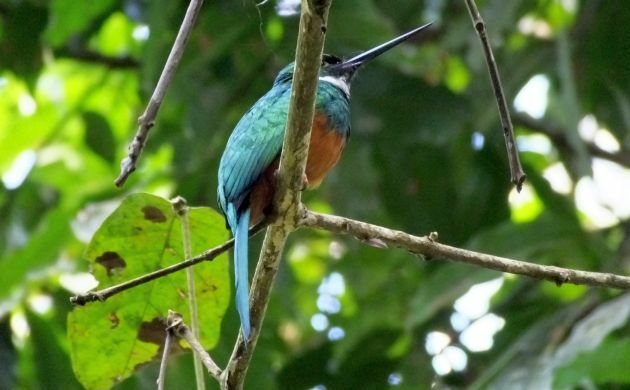 Rufous-tailed Jacamar: Fairly common in many areas of Costa Rica, including Carara. Always a pleasure to see this needle-billed, exquisite bird. 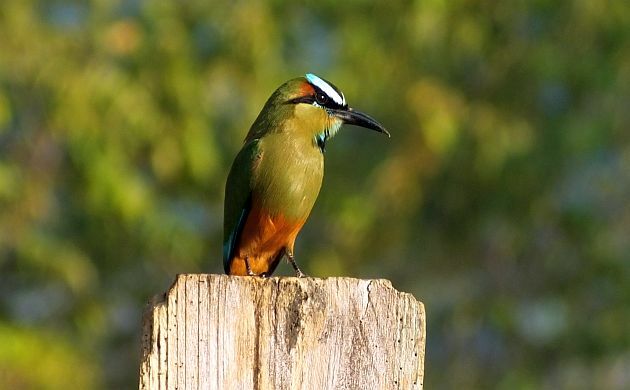 Turquoise-browed Motmot: Beautiful, common, and it can perch in the open- my kind of bird! 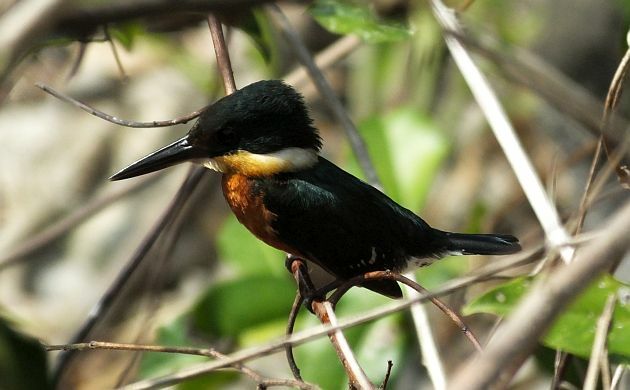 American Pygmy Kingfisher: Beautiful, not as common, and tiny. Look for it on the boat tour, or at the edge of any wetlands. 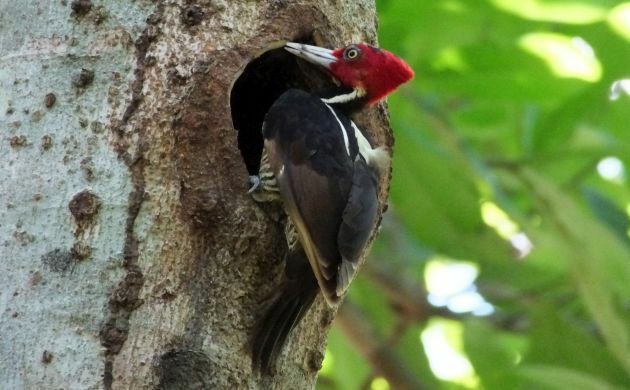 Pale-billed Woodpecker: The “ivorybill” of Costa Rica is doing well and by no means a phantom species at Carara and many other sites in the country. 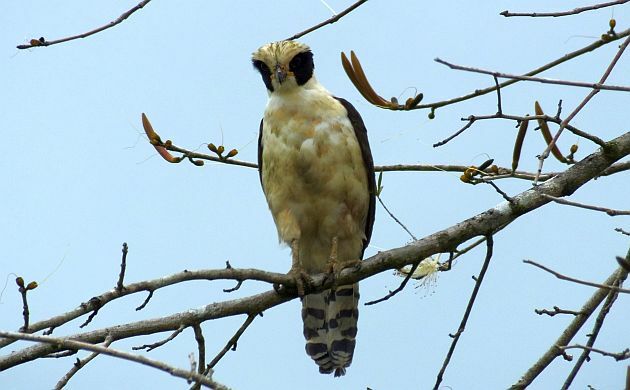 Laughing Falcon: This snake eating specialist is widespread and common in many parts of the Neotropical region, it is nevertheless always cool to hear and see. Fairly common around Carara. 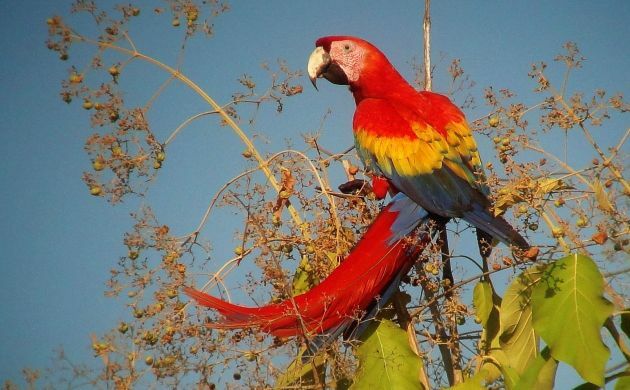 Scarlet Macaw: A true star of Carara, the national park protected a remnant population of this major bird for many years. Now, it appears to be on the rebound in Costa Rica and can be seen in several parts of the country. 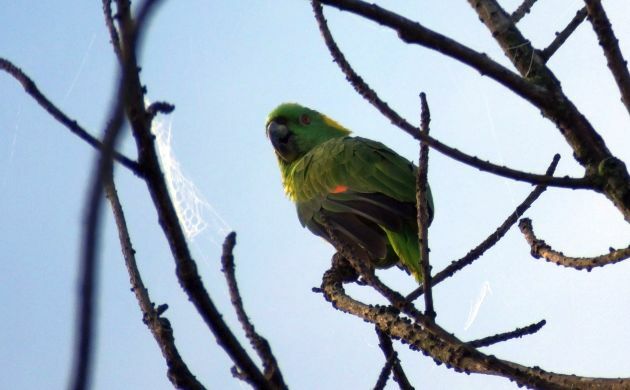 Yellow-naped Parrot: This vulnerable species is regular in sites just outside the national park. 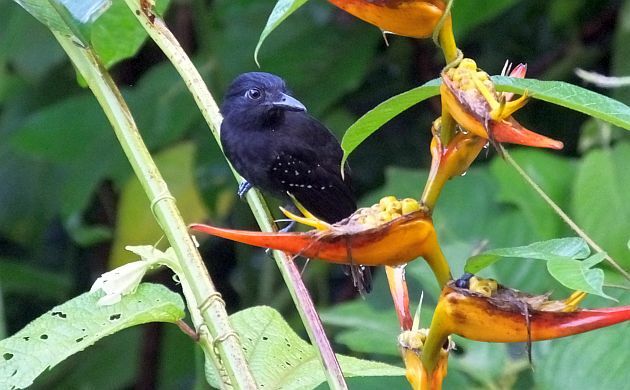 Black-hooded Antshrike: The wooden “laughing” song of this regional endemic is a common feature of the national park. 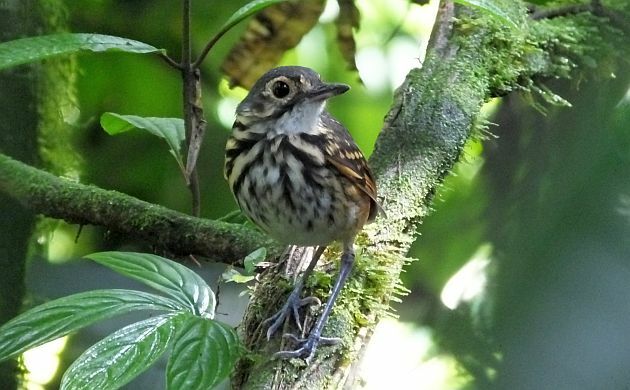 Streak-chested Antpitta: The forests of the national park are probably the most accessible, easiest place to see this species anywhere in its range. Black-striped Woodcreeper: Bird the mature rainforests in the park and you will probably hear, and maybe see, this striking woodcreeper. This one is especially nice because it’s easy to identify. 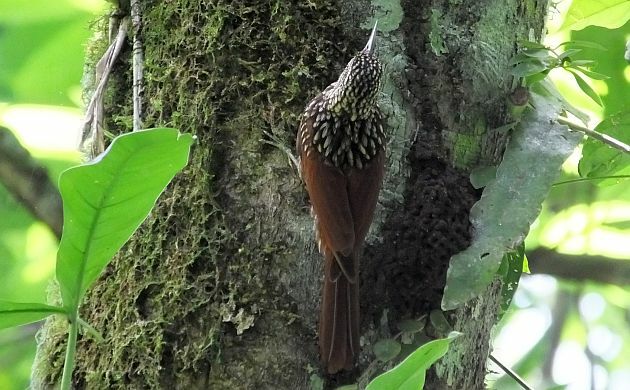 Keep birding and you might also find seven other woodcreeper species. 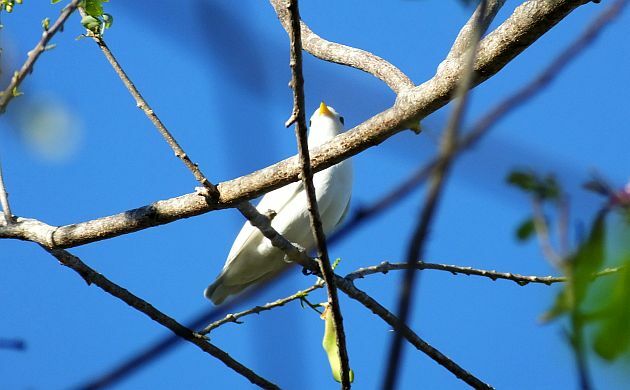 Yellow-billed Cotinga: This near endemic endangered mega has become very rare in Carara and the population that uses the park is probably on its last legs. 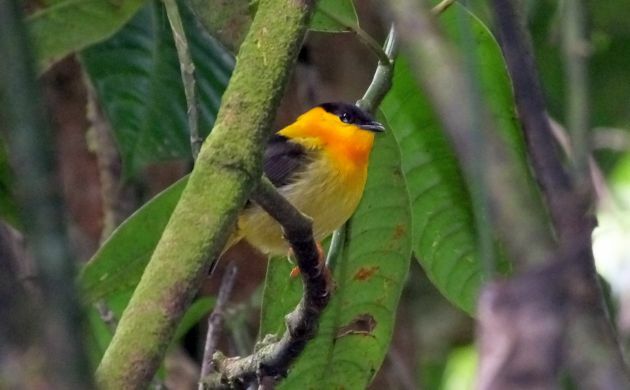 Orange-collared Manakin: This near endemic beauty is fairly common in the park along with three other species of manakins. Riverside Wren: One of the more handsome wrens, this near endemic seems to be imitating some babbler species from Malaysia. It’s common at Carara along with 8 other commonly seen wren species in the area. 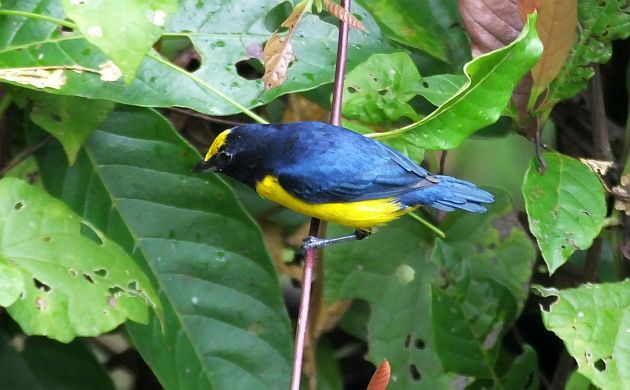 Spot-crowned Euphonia: Another regional endemic, watch for it the forest but forget about looking for spots on the crown. Instead, focus on the diagnostic black thighs. I was inspired to write this after ending a day of recent guiding in the Carara area with 160 species for the eBird list. That fine number of birds species is actually normal for a full day of birding in that fantastic (if blazing hot) area. Hope to see you there some day! Nice stuff. I’ve seen the Pale-billed Woodpecker in Guatemala but the rest would be new for me. 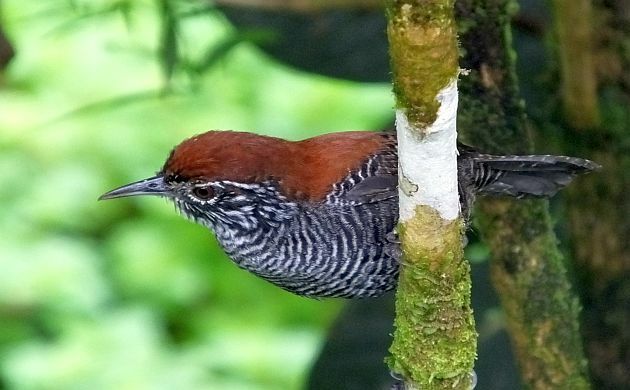 I particularly want to see the antshrike, that’s a family I’ve written about a lot and never seen. @Duncan- Hope you can come to Costa Rica some time so we can go see these and lots of other birds. That is without a doubt, an All Star group of birds. I am 0 for 20 with that group, which only makes me want to make that trip more! Beautiful pictures. as well.